. 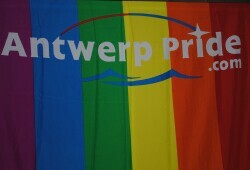 The 2nd edition of Antwerp Pride colors Antwerp with several parties, exhibitions and cultural activities. Antwerp is a gay(friendly) city with many gaybars and shops. The activities around Gaypride are find mainly on 2 locations. In particularly the quays (Waalse Kaai /Schelde Kaai) and North (Oudeleeuwenrui/Godefriduskaai). The well-known Van Schoonhovenstraat and surroundings participate also . Mass activities are the Pink Friday (village fair) on the Sinkenfoor in Antwerp on Friday and The White Party on Saturday afternoon. More than 40 activities on bars and clubs and the well-known afterparties. The Popi hysterical city bustour go out and drive along the gay districts in the city under accompaniment of Pipi. Also there are the Falcom Market on Saturday and for the rough people the HARD NIGHT in Petrol Club. like shopping in the Kammenstraat and Meir.